Practiced faithfully, Pilates yields numerous benefits. Increased lung capacity and circulation through deep, healthy breathing is a primary focus. Strength and flexibility, particularly of the abdomen and back muscles, coordination-both muscular and mental, are key components in an effective Pilates program. Posture, balance, and core strength are all heartily increased. Bone density and joint health improve, and many experience positive body awareness for the first time. Pilates teaches balance and control of the body, and that capacity spills over into other areas of one's life. Caryn offers one-on-one Pilates sessions and also teaches Pilates classes. See the Events and Classes page for upcoming classes. To schedule a private session see the Contact Us page for email and telephone. 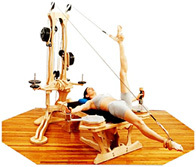 The GYROTONIC® System of Movement is a revolutionary total body conditioning and fitness methodology developed by Master Teacher Juliu Horvath, which derives from the principles of Yoga, ballet, swimming and gymnastics. The System simultaneously stretches and strengthens the body while increasing range of motion and developing strength and coordination. The natural, turbulence-free motion patterns create a bridge between contraction and extension through rotating movement of the joints resulting in a stronger, more balanced skeletal support structure. The Gyrokinetic conditioning method works in three dimensional, spherical fields expanding rather than constricting the natural outward flow of energy. Circular movements enhance this quality by working from the center, or core, outward to the extremities. The approach is rooted in optimizing bio-mechanics enabling clients to move with maximum efficiency while minimizing stress on the body. Fluidity is key and actual sports movements, like swimming and bicycling, can be simulated without limiting speed or resistance.